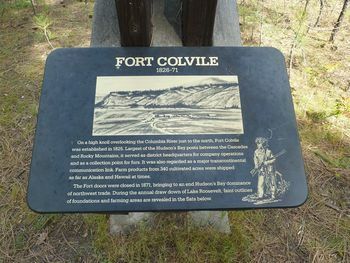 Fort Colvile (1826-1871) - Established in 1826 by George Simpson, governor of the Hudson's Bay Company (HBC), as the largest of the HBC posts between the Cascade Mountains and the Rocky Mountains. Named for Andrew W. Colvile, a governor of the HBC. (Do not confuse with Fort Colville which was the United States Army fort located in the same area.) Located at Kettle Falls on the Columbia River in Stevens County, Washington. Closed in 1871. Construction of Fort Colvile began in August 1825 but proceeded slowly, due in part to the apparent ineptitude of some of the crew. 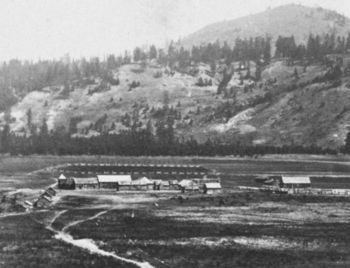 The new quarters were ready by the following spring and provided a log stockade surrounding a number of log buildings, constructed in the post-and-sill style common to Hudson's Bay Company (HBC) posts. By 1841 the HBC farm spread over two hundred acres, two-thirds of which grew crops of wheat, potatoes, barley, oats, corn, peas, and garden produce. The company's cattle herd had increased from the initial bull and two heifers in 1825 to nearly two hundred by 1841. 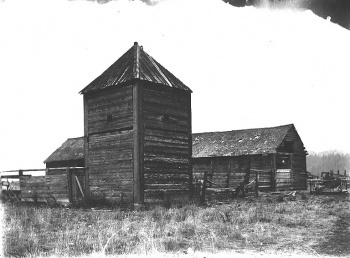 Farm facilities expanded in 1830 with the construction of a water-powered grist mill on the Colville River. In addition to supplying its own needs, Fort Colvile sold cheese, butter, and pork to the Russians at Sitka, Alaska, and sent flour, cornmeal, pork, and other products to HBC operations throughout the Pacific Northwest. In the fall of 1854, an HBC employee discovered gold on the sandbars of the upper Columbia River, in the vicinity of Fort Colvile. When the news leaked out a few months later, a predictable rush of miners flooded the region just as Governor Stevens was concluding a treaty process. Colville chief Peter John closed his lands to non-Indians in August 1855, and the following month a number of miners and an Indian agent were killed by Yakamas. A state of war erupted, and both sides remained on high alert during the next three years. Stevens met with leaders of the Spokane, Coeur d'Alene, and Colville tribes late in 1855 in an effort to contain the war. They reached no agreements at that time, however, and a meeting planned for the following spring never occurred. 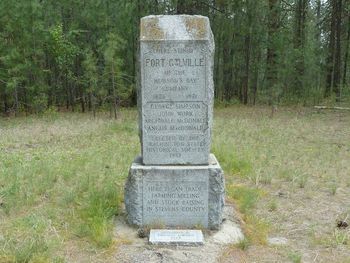 A frightened group of settlers met at Fort Colvile in November 1857 and petitioned the government for a company of soldiers to protect them. Discovery of gold on the Fraser River in British Columbia in 1858 intensified the problem. Colonel Edward J. Steptoe and his two hundred troops felt the full force of Indian wrath when they ventured out from Fort Walla Walla (2) in May, only to be soundly defeated by a coalition force of between six hundred and sixteen hundred Indians. The victory, while sweet, was short-lived. Colonel George Wright and his Army troops won two decisive battles later that summer and ended the war. In an effort to permanently cripple the Indians and ensure that they could never fight again, Wright ordered the killing of eight hundred horses, a devastating blow to a people whose welfare and wealth depended upon these herds. Troops also destroyed grain crops and stores of food in Spokane territory and then hung fifteen Indians for alleged murders. 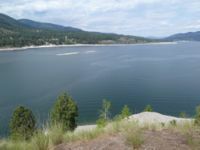 Located under the waters of Lake Roosevelt at the former Kettle Falls on the Columbia River. Markers and interpretive signs are located on the bluff above the submerged location. Location: Located under the waters of Lake Roosevelt at the former Kettle Falls on the Columbia River, Stevens County, Washington.